As a photographer I have a love-hate relationship with Facebook. I reached a point where I was no longer seeing posts from my friends and family in my news feed. Everything was wedding photography related, and rather than inspiring me, I felt like it was sucking the life out of me! First of all I recommend doing this from your computer rather than your phone, just to make things easier. 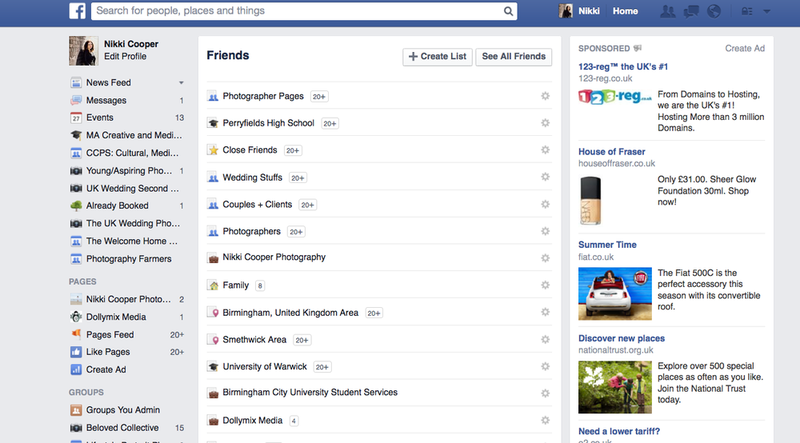 On the left hand side of your news feed you'll have your Pages, Groups, Friends and Interests. Here you'll see a list of groups. Facebook provides some for you already set up, such as 'Family'. But you can create your own by clicking '+ Create List' at the top. You'll then get a box pop up asking you to name your list... mine has the imaginative title 'Photographer pages'. Next you need to start adding people and/or pages to your list. If you try to add via the pop up box, you'll only be able to add profiles NOT pages... so we need to do an extra step. Click 'Create' and your list will open. On the right hand side there's a box asking you to add friends to list. If you click in here and start typing you'll now be able to add pages and personal profiles! I found the best way to find all the pages I'd liked was to start typing 'Photog' and go from there. Now you've got all the photography pages/profiles in one place you can click through to each of them to 'Unfollow' them. On each page/profile there will be a 'Following' button under the cover photo. ...and hey presto, your news feed will now be photography free! I hope you found this helpful. Do you have any tips on how to manage social media to share?